"CA-28" redirects here. For the state route, see California State Route 28. California's 28th congressional district since January 3, 2013. Map of the 28th congressional district. California's 28th congressional district is a congressional district in the U.S. state of California, in Los Angeles County. The district is regarded as a Democratic stronghold and is currently represented by Democrat Adam Schiff. The district includes West Hollywood, Burbank, parts of Pasadena, Glendale, the Verdugo Hills communities of Sunland and Tujunga, as well as parts of central Los Angeles including Hollywood, the Hollywood Hills, Echo Park, Silver Lake, and Los Feliz. As it includes Glendale and Little Armenia, it has the largest Armenian-American population of any district in the country (Schiff cites the Armenian population at greater than 70,000). Formerly, from 2003 to 2013, the district included about half of the San Fernando Valley, including North Hollywood, in the Greater Los Angeles Area. 93rd Redistricted from the 16th district and re-elected in 1962. 95th Redistricted from the 37th district and re-elected in 1974. 107th Redistricted from the 33rd district and re-elected in 1992. 112th Redistricted from the 26th district and re-elected in 2002. 116th Redistricted from the 29th district and re-elected in 2012. As of April 2019[update], there are three former members of the U.S. House of Representatives from California's 28th congressional district that are currently living. The most recent representative to die was Alphonzo E. Bell, Jr. (served 1963-1975) on April 25, 2004. The most recently serving representative to die was Julian Dixon (served 1983–1993) on December 8, 2000. 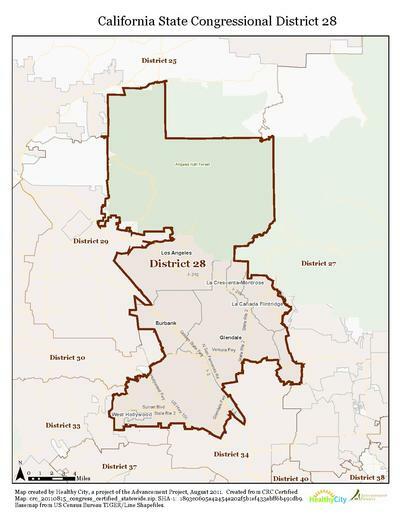 ^ "California's citizen commission final district maps: Find out what's changed where you live". latimes.com. ^ "1952 election results" (PDF). ^ "1954 election results" (PDF). ^ "1956 election results" (PDF). ^ "1958 election results" (PDF). ^ "1960 election results" (PDF). ^ "1962 election results" (PDF). ^ "1964 election results" (PDF). ^ "1966 election results" (PDF). ^ "1968 election results" (PDF). ^ "1970 election results" (PDF). ^ "1972 election results" (PDF). ^ "1974 election results" (PDF). ^ "1976 election results" (PDF). ^ "1978 election results" (PDF). ^ "1980 election results" (PDF). ^ "1982 election results" (PDF). ^ "1984 election results" (PDF). ^ "1986 election results" (PDF). ^ "1988 election results" (PDF). ^ "1990 election results" (PDF). ^ "1992 election results" (PDF). ^ "1994 election results" (PDF). ^ "1996 election results" (PDF). ^ "1998 election results" (PDF). ^ "2000 election results" (PDF).